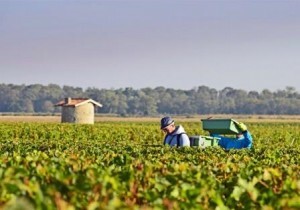 The 2012 Bordeaux vintage is a year for vineyard management and workers. Call it a wine makers vintage, or change your tune and name it vineyard managers vintage. Either descriptor works perfectly. The estates with the financial ability to take the necessary actions in the vineyards during the season, coupled with the willingness to severely declassify unripe grapes will produce the best wines. Even then, it’s going to be a difficult vintage with small quantities of wine. From start to finish, the growing season and 2012 Bordeaux harvest have been stressful for the vintners, the vines and with the grapes now in the process of being vinified, the winemakers. The 2012 Bordeaux vintage did not get off to a good start. Following a cold winter and wet spring, the April rains drenched the Bordeaux wine region. Following the April rains, there were outbreaks of mildew, which required spraying. May was warmer than April. Things cooled down a bit again in June. All this brought on flowering that was late and uneven. That resulted in small bunches with berries that ripened at different times, which brought down the quantities and necessitated in serious work in the vineyards and intensive sorting at harvest. While a growing season is never over until it’s over, uneven flowering is never a good omen. The lateness in the flowering pushed the entire vintage back 2 to 3 weeks, depending on the chateaux. Generally speaking, late harvests are not usually harbingers of good things to come. If everything that took place until the end of June didn’t offer what happened next offered additional challenges with 2012 Bordeaux vintage. After an average July, Bordeaux experienced a torrid heat spell and drought in August and September that stressed the vines, especially the young vines. At one point, temperatures soared to 42 degrees Celsius, which is 107 degrees! Other days crossed 100 degrees. It was extremely hot and dry. The vines shut down and the vintage was on track to be even later than originally anticipated. Close to the end of September, things improved due to the much hoped for combination of warm days, cool nights and some desperately needed rain, which helped nourish the vines. The initial days of October offered reasonably warm temperatures during the day, coupled with cooler weather at night for vintners with Merlot ready to pick. In the Medoc, it was hurry up and wait. Tom Petty could have been blasting with “Waiting is The Hardest Part,” because growers needed to wait as the Cabernet Sauvignon was having difficulties ripening. This was already October. 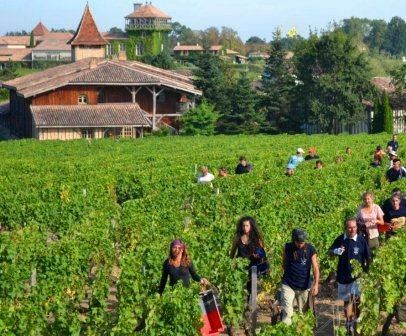 The conventional wisdom says, at some point, there was little to be gained by waiting and more to lose, so the 2012 Bordeaux harvest started taking place. Some estates began picking young Merlot in late September, but most held back until about October 1, with a few growers waiting another week or longer. Most producers brought all their fruit in by the middle of October. Pomerol is usually the first appellation to harvest, due to their Merlot dominated vines. Interestingly, picking was taking place simultaneously in the Left Bank on October 1. 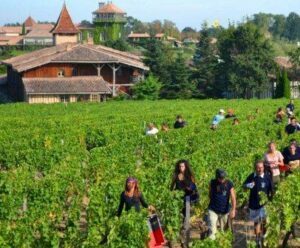 Numerous Pessac Leognan properties began their harvest before Pomerol. Chateau Haut Brion began working on their young Merlot vines September 17 and Chateau Haut Bailly was not far behind, with a September 27 start date. Most chateaux were in the thick of things by October 4, although Domaine de Chevalier held off until October 8. While pleasant, cooler weather was initially forecast to continue, by October 8, things changed quickly when massive amounts of rain dropped over the entire Bordeaux region. With accompanying temperatures in the mid to upper 60’s and higher in some areas, vintners were concerned about the potential of Botrytis, due to the humid, tropical conditions. At that point, the fruit needed to be picked, regardless of the state of maturity. Similar to what took place last year with the 2011 Bordeaux vintage, ripening was uneven. It was not just bunches that were not ripening, individual grapes in bunches achieved varying degrees of ripeness which made sorting more important than ever. Optical sorting was more widely used than ever with the 2012 Bordeaux harvest. 2012 Bordeaux could be a year where the dry, white Bordeaux wines shine. The berries were picked in September, under optimum conditions. Most producers were done harvesting the white wine grapes by September 25. The same cannot be said for the sweet wines of Sauternes and Barsac. This has been a difficult year for the development of Botrytis, due in part to the cold nights. With November closing in, most of the top estates were still nervously waiting to harvest. All this adds up to low yields for most producers. In fact, the French minister of agriculture reported that 2012 would produce the lowest yields since 1991. It’s interesting to remember previous years like 1991, a vintage that forced some properties to declassify their entire harvest. With today’s modern technology and vineyard management techniques, vintages like 1991 which produced atrocious wine are a thing of the past. Bordeaux is not the only European wine region to suffer in 2012. All over the continent, numerous European vineyards experienced difficult conditions. It was announced that across the board, production of European wines were at their lowest levels since 1975. Generally speaking, low yields are usually a good thing. Low yields produce more concentrated wines. But when low yields are coupled with grapes that did not achieve full, phenolic ripeness, at the end of the day, the only thing vintners are primarily left with is less wine. If the small quantities of wine available to sell are used as an excuse by owners as a reason to raise prices, grapes are not the only thing that will be in short supply. Customers for their wines will be in an even shorter supply than the wines. 2011 Bordeaux has not sold well to consumers. Prices for 2012 Bordeaux wine need to be lower in price than the previous year. This is healthy for the marketplace in the long run. 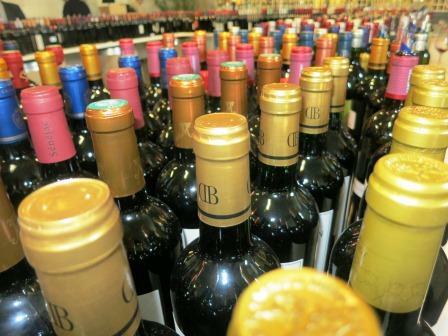 Ample stocks of good wines from top years are still available for sale. Consumers can easily find strong Bordeaux wine from 2010, 2009 and even 2005. There are different vintages for different markets. Some wine buyers prefer more classic or lighter years. Other wine collectors seek riper, bolder years. The marketplace welcomes both types of wines and consumers. But each vintage and style needs to be appropriately priced. Bordeaux should reduce prices on vintages like 2012 and 2011. In turn, there are wine buyers willing to pay more for the best years. Reports from producers on the 2012 Bordeaux harvest have ranged. For the red wines, some were quoted as saying the pulp is ripe, the seeds varied in ripeness, but the skins did not ripen. In the Left Bank, there are estates that feel their Merlot turned out better than their Cabernet. In the Right Bank, producers in Pomerol and St. Emilion are optimistic about the quality of their 2012 Bordeaux wines. The early reports show lower alcohol levels for the wines than more recent, highly rated, expensive vintages. 2012 Bordeaux wine has the potential to be classic in style, which should please thirsty fans of traditional Bordeaux wine. While quantities are small, in many cases, it’s not much different than what the chateaux were able to produce in 2011. Many vintners are comparing the 2012 Bordeaux vintage a blend of 2002 and 2008. With the April tastings rapidly approaching, all of us will have a much better idea about the quality, style and character of the 2012 Bordeaux vintage. Let’s just hope they get the price right.